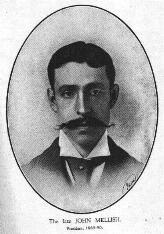 The Rangers had been holding sports successfully since their first venture into athletics promotion in 1881. When the Clydesdale Harriers came into being in May 1885, they trained at the Rangers grounds at Kinning Park and Ibrox. 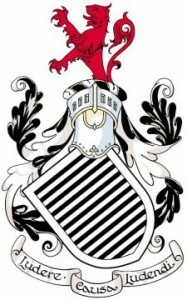 The clubs had members in common and they held joint sports for a while. This changed in 1890 when the clubs agreed to hold their separate meetings. The joint ventures had been held at the start of July but from 1890 the Rangers meeting was held on the first Saturday in August: this would be a fixture in the calendar right up into the 1960’s. The Herald commented upon this. 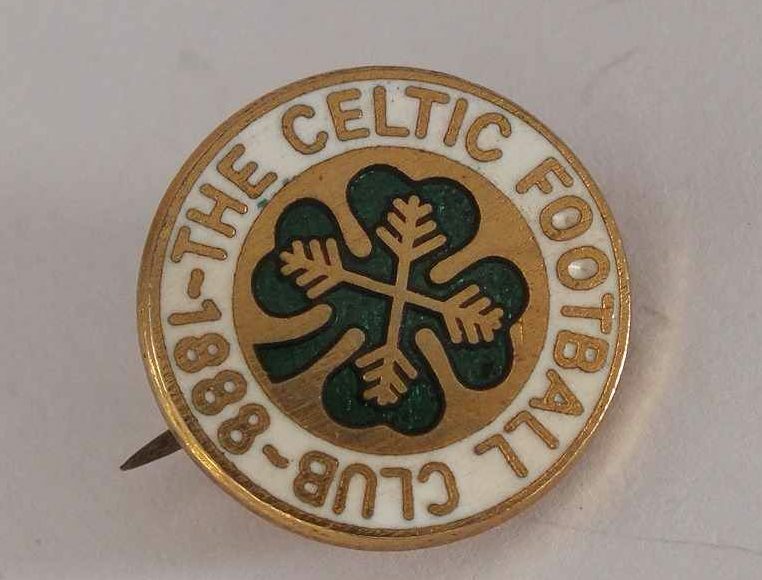 The absence of the new club, Celtic FC, from the football was maybe explained by the fact that they had a tournament of their on on that day and had three 5-a-side teams competing there. Events contested at Ibrox in 1890 included quarter mile flat handicap confined to football section (J Henderson (30 yards) won by a foot from AH McKenzie off 10 yards; quarter mile flat handicap open won by D Wright Abercorn FC from CL Aitken, Clydesdale H; one mile flat race handicap won by W Henderson from AG Colquhoun, both Clydesdale H; three miles ordinary bicycle race; two mile safety bicycle race. Bicycle races were held at this time on machines with solid tyres, the pneumatic variety just being introduced. Some meetings would hold two races at a particular distance – one for bicycles with solids and the other for Bicycles with pneumatics. On the same day as this report was published in the Herald, the ‘Scottish Referee’ had a letter debating whether the pneumatic tyres should be banned. Among the officials on duty were John Mellish and Tom Vallance as Judges, and Alex Vallance as Time keeper. With a big crowd, quality athletics on display and a profit at the end of the afternoon, what more did a meeting want? The meeting on 5th August 1893 was a well supported one – 12 heats, semi finals and a final of the 100 yards with Rangers player JR Gow (3 yards) making the final’ ; 8 heats of the 220 with Rangers man H Barr winning his Heat. The ‘Glasgow Herald’ reported as follows. At the end of the day’s sport the prizes were presented by Mrs Primrose, wife of Bailie Primrose. 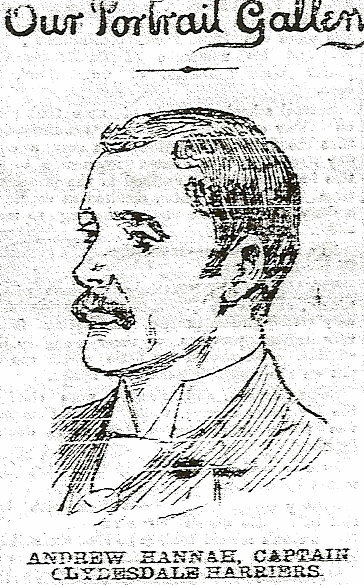 The ‘Glasgow Herald’ had an interesting take on the 1894 meeting when it began “The new professionalism had its beginning at Ibrox Park on Saturday and Rangers FC are to be congratulated on their efforts to popularise cycling in Scotland. 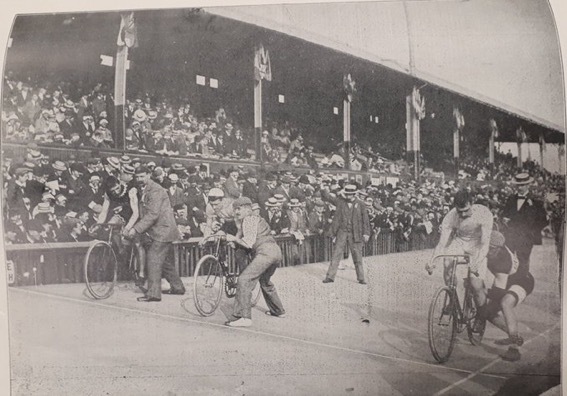 Though the number of riders present fell far short of what was expected, still there was a fairly large contingent of what is known as the Paris crowd to make the racing interesting to the 15000 spectators who came there impelled as much by curiosity as much as by desire to see good sport. …” The meeting, which included a four-a-side football competition, seems to have been the only one held on the Saturday with the amateur athletics being held on the following Monday. 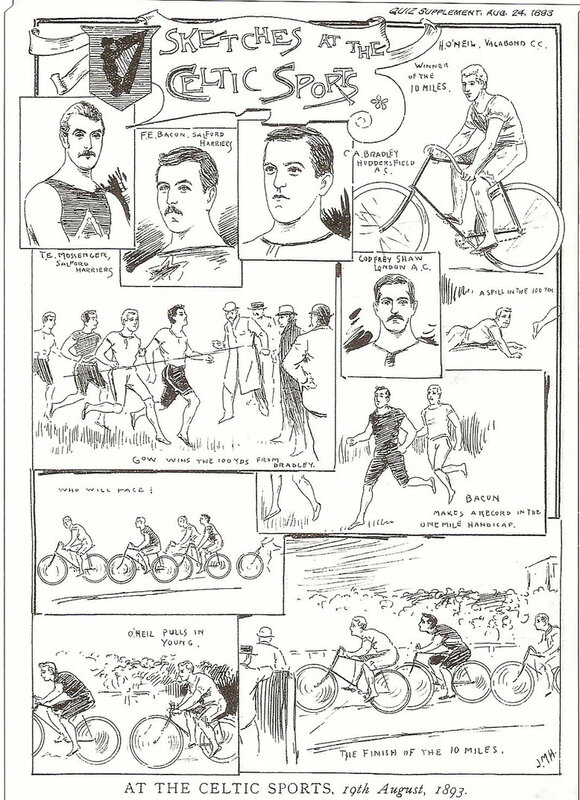 Events at the meeting included 100 yards handicap (10 heats, 2 semi finals, final), 600 yards flat handicap (third in this race was RS Langlands who would become the first Scot to run under two minutes for 880 yards), Two Miles flat plus three cycle races (half mile, one mile and five miles). It was a very short programme compared to the normal Rangers sports and for the athletics supporters being limited to three events on a Monday evening was not what they would have wanted. It had been an experimental weekend, the least successful meeting for several years but 1895 would see a return to the normal format. 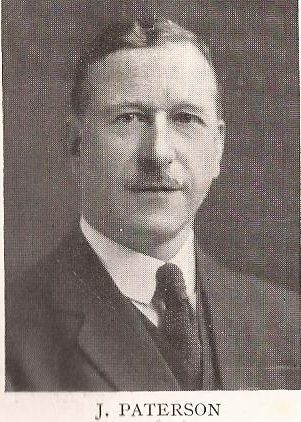 However the pace in athletics events for their relative sports was being set, for the time being at least, my Maley of the Celtic who was inviting the top men from all over Britain, maybe especially Ireland, to his club’s meetings. 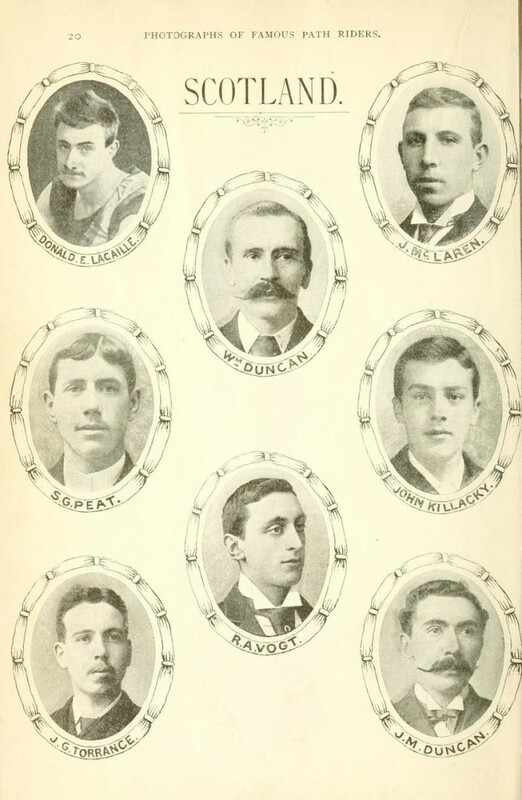 Celtic FC was founded 1887 and played their first match in May 1888. 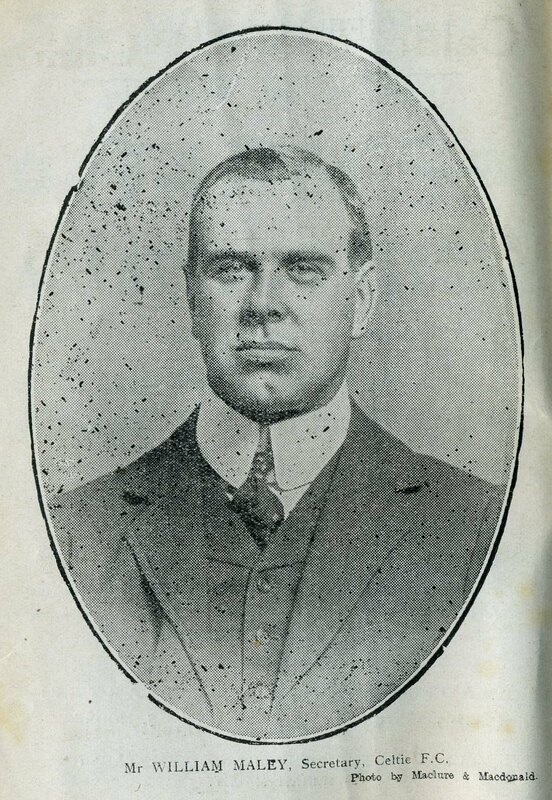 Many football clubs (QPFC, the Rangers FC, Third Lanark, Partick Thistle, etc) organised sports meetings at the time and Celtic, with such as Willie Maley and his brother Tom on the books were almost bound to follow suit. Two years after that first football match, they were organising their first meeting. But before the big meeting the following week, there was the report on the preliminary sports on the first Saturday in August: a date that was synonymous with the Rangers Sports at Ibrox. “Some disappointment was caused at the Celtic Sports on Saturday when it was became known that a great number of the clubs who had entered in the five-a-side competition was not likely to put in an appearance. This robbed the sports of a great deal of interest. A little time had to be “frittered” away and once or twice the crowd became nervous. What a big crowd too! If there’s a club in Scotland that can make a “draw”, that club is the Celtic. The track looked a “hummer” (?) but it falsified its appearance later on. After the 300 and 200 yards had been run, the holes left on the surface showed that it was still heavy. It will require all the rolling it can get between now and next Saturday. The club possesses a few capital sprinters and the confined handicaps were really enjoyed by the big crowd. Tom Maley was handicapper to less than a step, and it was nonsense to be asked to give away the distance to some of the competitors. Kelly with practice we fancy, would make a mark in distances under a quarter and over 100 yards. P Gallacher collared the 300 yards prize; he had to run for it. It was only four years since Willie Maley had won the SAAU 100 yards championship and it is good to see that the former Clydesdale Harrier was still competing. The comments on Tom Maley and handicaps above are reproduced as in the paper but what happened was described further through the ‘Referee’. There were four Heats of the 100 yards. “The first brought out only two runners Kelly 4 yards, Collins 10 yards. Kelly ran a magnificent race and when only half the distance was traversed had overtaken his man and eventually won anyhow. 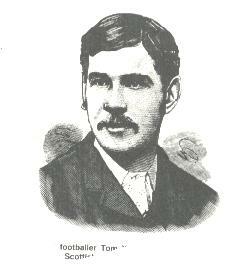 In the second Heat, Willie Maley had some work ere he beat his two opponents but he ran strongly to the finish. In the fourth Heat the full complement put in an appearance. Tom Maley was scratch but after the start had scarcely got into his stride when he drew up, being unable to give six yards to P Gallagher who came romping home. Murphy had 9 yards and McVey 11 yards off Maley.” Willie Maley won a hard fought final to win by half a yard from Gallagher. Both Maleys were in the 220 with Tom again off scratch, as he was in the 300 yards where he finished third. All events were confined events. Celtic played Cambuslang in the 5-a-side but since Cambuslang had turned up with only four players, they ‘picked up the odd Celt’ and fought their way to the final where they would meet the Celtic number one team the following Saturday. The value of the prizes “which the executive without regard to cost have secured. 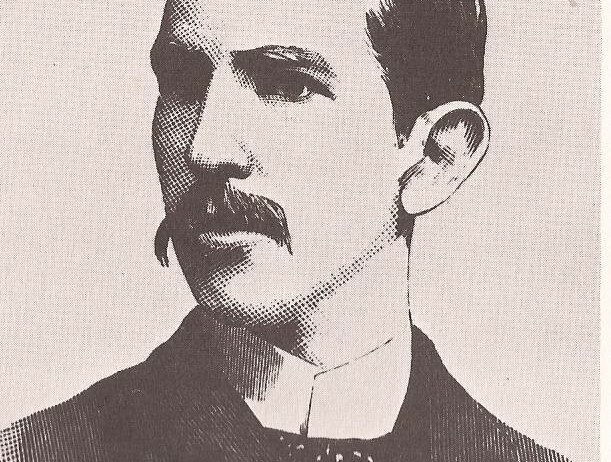 Novel it may have been in Scotland but Daniel Delany Bulger was a multi title winner from Dublin who had won the Gaelic Athletic Association 100 yards in `886, 1887, 1888, 1889 an 1890, and the Irish AAA’s 100 yards in 1888, 1889 and 1890 and the 220 yards, GAA, in 1885, 1886 and 1887, and IAAA in 1885. He did run at Parkhead despite the doubts but was unplaced in both handicap finals. 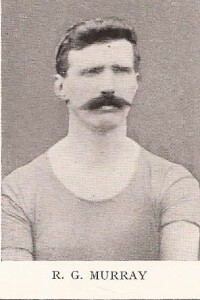 In the sprints, Tom Maley was more fortunate in the open 100 yards, off 3 yards, than he had been in the confined version tha previous week: he won his heat, semi final and final, where the winning time was 10.2 seconds; J Kelly of Celtic won the 220 yards from a mark of 15 yards; the half mile had 17 starters and was won by Mitchell of Harriers in 2:04; the Mile with 15 runners was won by A Russell of St Mirren FC; and the two miles flat handicap was won by Henderson (300 yards) from McCann (100 yards) and Russell of St Mirren (150) third. Top event however had to be an event held for the first time in Scotland – a 100 yards invitation scratch race. 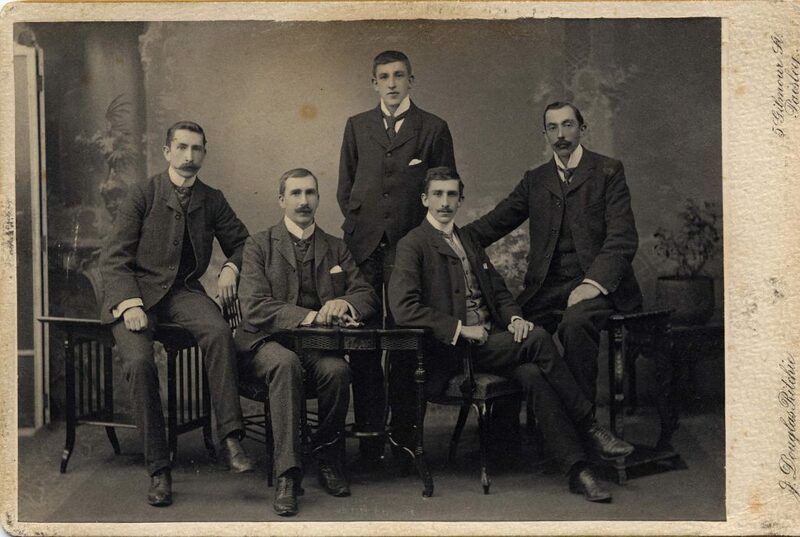 There wre four starters – Bulger, Tom Maley, Tom Blair and McPherson. Bulger won from Blair in 10.4. Interestingly Willie Maley ran in the 100 yards from 5 1/2 yards and won his heat but failed to get through his semi final but – h seconds was running as ‘Celtic FC’ and Tom was running for ‘Clydesdale Harriers’. There were also bicycle races on the programme as well as a dribbling race (confined to reserves), a sack race which had heats and a final, and the final of the five-a-side in which Celtic won by one goal and one point to one point. “The ground of the Celtic is well suited for the football but for an athletic meeting such as was held on Saturday afternoon it is perhaps the most poorly adapted enclosure in Scotland. This blight, we are in a position to state, will be removed by next summer. A cinder path worthy of the reputation and position of the club will be laid, and other alterations effected which will place Parkhead on a level with Hampden, Ibrox and other athletic enclosures. Had the facilities for running been good, the Celtic sports would have been the finest, from an athletic point of view, ever seen in Scotland. … “ It went on to mention in particular the corners were too “sudden” for the runners and good times. But the comments of the two reports confirm that the standard at this first venture was remarkably high. 4.5000 spectators attended the preliminaries meeting on the first Saturday in August and was enjoyed by all but the programme for the main meeting was not available a week beforehand other than that the main events would be 100, 220, 440, 880 yards and one mile flat races, dribbling race and the final of the 5-a-side tournament between Celtic No. 1 and Kilmarnock Athletic plus bicycle races at half mile, one mile and two miles (both for solid tyres and pneumatic tyres) and a hurdles race. 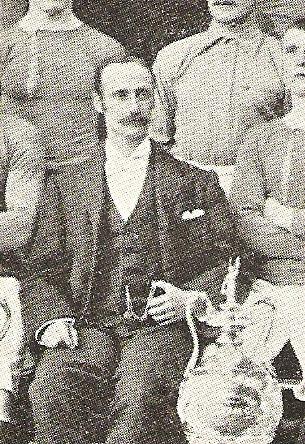 RA Vogt, champion and record holder at distance from half a mile to over twenty miles was to appear in the cycle races as were Torrance, Cockburn, Campbell and Howie but Collins would not be there as he preferred the East Stirling FC Sports. Vogt had taken a tumble at the last year’s sports but that’s part of the excitement of the event for the spectators. 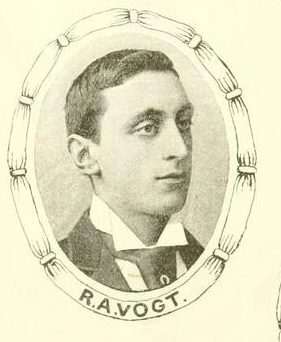 RA Vogt, Clydesdale Harriers, who was a great favourite at Parkhead. 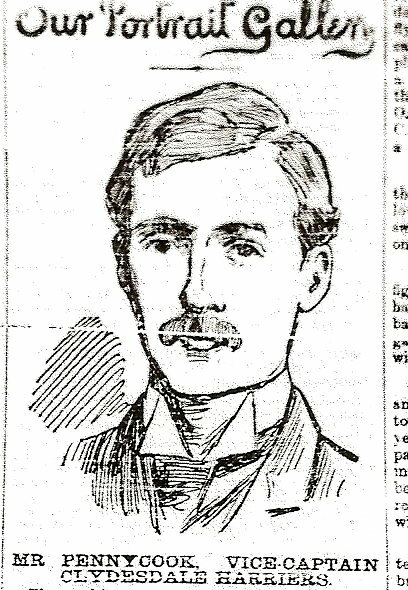 Celtic certainly did have athletes from all three home nations competing in 1891 and the’Glasgow Herald’ tells us that C Bradley of Huddersfield was the best English sprinter that has visited Glasgow. 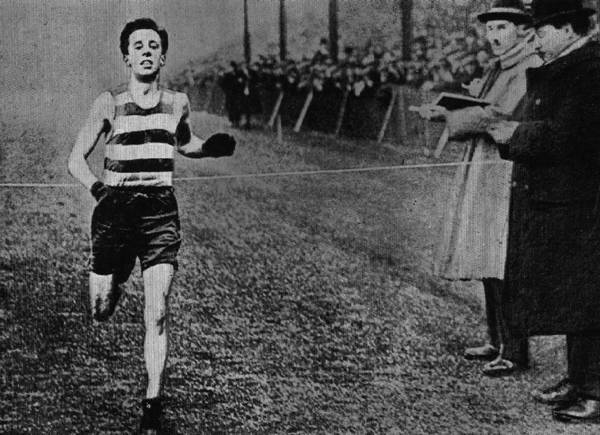 He won the scratch 100 yards race, was second in the open handicap race to Dickenson of Dublin University. In the cycle races Vogt had two firsts and a third. There was however no financial loss and rain is to be expected in Scotland. 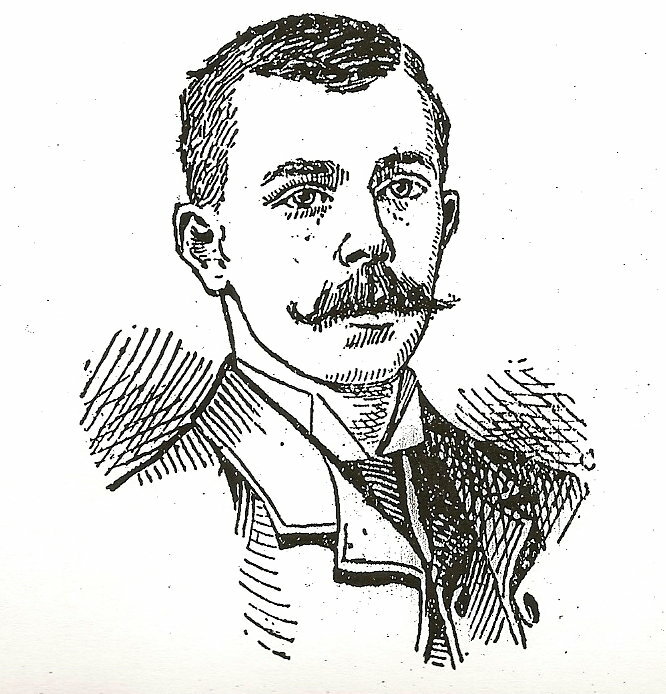 Bradley was again in action, the highly regarded WJ Holmes was in the half-mile and several of the best cyclists took part. DD Bulger, described as English and Irish hurdles champion and record holder, ran well enough but was beaten by Dickie who had 11 3/4 yards start. Hugh Barr, Scottish international long jumper and sprinter also took part in the sprint, WJ Holmes won the half mile in 2 minutes dead and Bradley was described as the finest sprinter ever seen in Scotland. There were stars everywhere. Bradley won the 100 yards invitation from Bulger (running from his hands), with McCulloch and Barr racing for third place. Bulger ran in the hurdles but failed to break the record – little wonder given the weather. The club had a supplementary meeting on the Monday, 15th August, 1892, with a 100 yards (Bradley scratch. W Maley 6 1/2 yards, and several others), 600 yards handicap, three quarters mile flat handicap, plus bicycle races. The meeting was very successful with events at a variety of distances being run and cycle racing also on the programme. 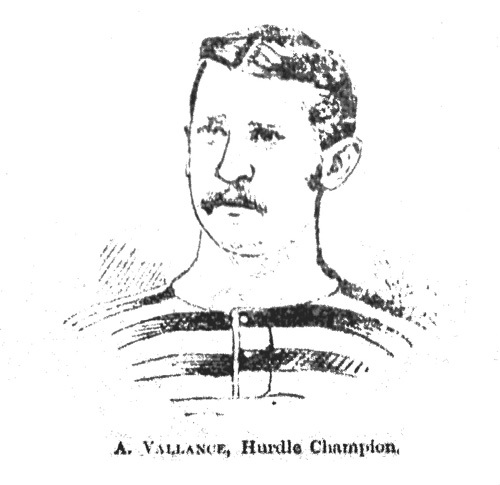 The 100 yards handicap had six heats and Bradley won from McCulloch and Blair of QPFC; a 600 yards flat race was won by Woodburn of West of Scotland; a three quarter mile handicap was won by Campbell of Clydesdale; the ten miles cycle race was won by McLaren from Vogt and Mecredy won the half mile cycle race. 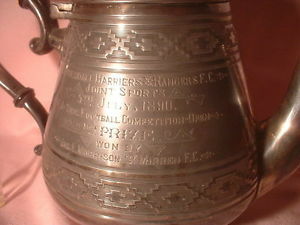 The 120 yards had twelve heats, three semi finals and a final, won by Bradley from Huddersfield; 100 yards flat race invitation handicap won by JR Gow (Rangers) from TE Messenger Salford; the 120 yards hurdles had three heats and a final, won by Shaw of London; 300 yards flat race handicap with eight heats and a final, won by AH Thom (Third Lanark) off 3 1/2 yards; half mile handicap open won by SW Ashworth from Manchester; one mile flat race handicap won by SW Ashworth. 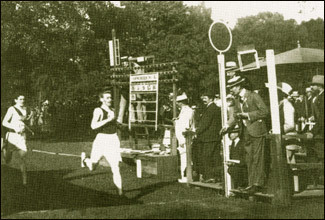 The back marker in the open mile was Fred Bacon (Salford, second) who set a new record of 4:25. There were also half mile bicycle race, 5 heats and a final*, one mile handicap race open to riders receiving handicaps up to 100 yards from RA Vogt (3 heats); three miles bicycle race handicap (3 heats and a final); and 10 Mile bicycle race won by O’Neill (Vagabond AC) from Vogt. * In the half mile race, third heat, Vogt punctured and had to get a new machine; McCaig waited on him and Vogt allowed him to win. The success of the meeting can also be seen in that the amount drawn at the gate was £350:10:6 and with other sums due the total was over £500. The follow up meeting on the Monday night had many good performances to commend it but the ‘boisterous weather’ did nothing for the crowd size. 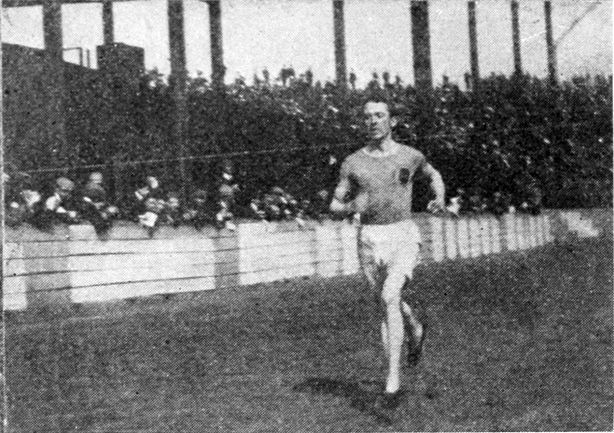 Bacon set another record – for the thousand yards this time – of 2:19.4; O’Neil equalled Vogt’s quarter mile flying start record of 32.4; the final of the 120 yards flat handicap had a marvellous race between Bradley of Huddersfield, Gow of the Rangers, Lumley of Newcastle and Young of Beith with inches covering all four at the finish – Bradley won; Godfrey Shaw won the hurdles race and Crossland of Salford won the two miles. Another good evening’s sport. The preview of the 1894 sports in the ‘Scottish Referee’ waxed lyrical: “Celtic are busy completing their arrangements for their Saturday and Monday Carnival. To the club that has competed such athletic triumphs in the past, nothing is impossible, and, great though their previous records be, we expect from the labour and enterprise they have devoted to this meeting that it will result in all previous records being bust. After that the meeting hand plenty to live up to. 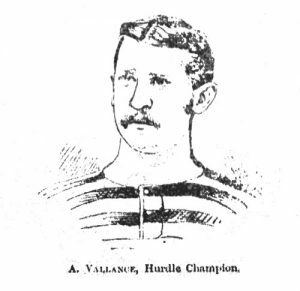 The crowds had seen Willie and Tom Maley in action at the club sports and on 11th August 1894 they saw youngest brother Alex competing in the sprints. 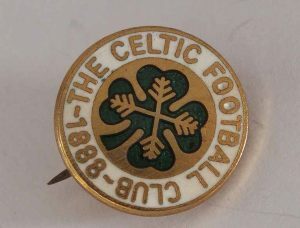 “The annual sports of the Celtic FC were held on Saturday afternoon at Celtic Park, Parkhead. The weather was dull and threatening but fortunately the rain held off and the events were carried off under favourable auspices. Nearly all the champions of Britain competed, and although there were no records broken some accomplished wonderful time considering that there was a strong wind. 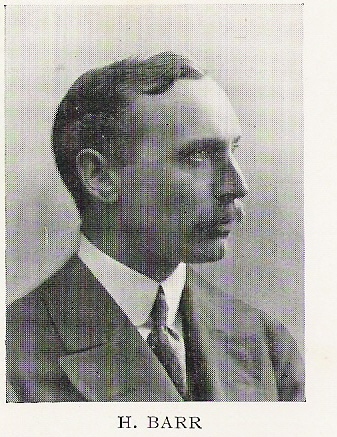 The arrangements of the secretary, Mr William Maley, were excellent and the sports were an unqualified success. Representatives from the Queen’s Park, the Rangers and nearly all the leading clubs gave assistance in carrying out the programme. It was estimated that 17000 persons were present, and with the supplementary meeting tonight (Monday 13th) the club will doubtless reap a handsome surplus.” To give a notion of how the spectators saw the meeting, the results below are in the order in which they took place. Alex Maley was mentioned – he ran in the 100 handicap and won his heat off 13 yards in 10 seconds dead but did not progress through the semi final. There were also a 100 yards and a 120 yards hurdle race as well as two cycle races with the riders eventually riding in the dark. In 1912 the meeting was held on 27th July and the programme contained five-a-side football, a 15 mile race featuring Kohlemainen of Finland for a £25 a head stake, a penalty kick competition, and a footballers race in fancy costume. The five-a-side tournament was held ‘for behoof of’ Billy McCartney, Clyde and ex-Hibs FC, and featured Hibs, Clyde, Partick Thistle, QPFC, Third Lanark and Hamilton Academicals. The 15 miles race was run over 60 laps of the track and while it was making progress, the penalty kick competition was going on in the infield. 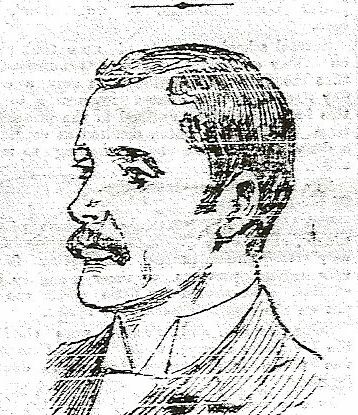 Popular comedian George Robey was allowed to take part. The race resulted in a win for the Finn in 1 hour 22 minutes. … and went on to comment on the fine weather with the track loose on the surface but in good order. The events on the rogramme were 120 yards, 220 yards, 880 yards and One Mile, all open handicaps. The one mile featured Kohlemainen of Finland and Hans Holmer from America which was won by the latter in 4:27 with Kohlemainen dropping out 20 yards from the finish. 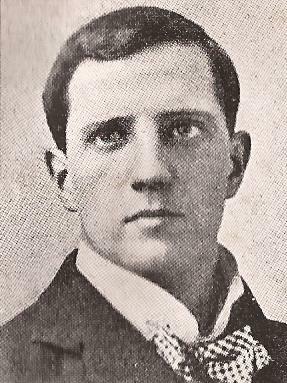 Jack Donaldson was an Australia and touring Europe in 1913. 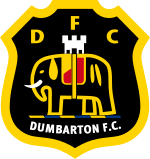 The ‘Dundee Courier’ of 28th July told us that Donaldson’s time for the 120 yards in his Heat was 21.25 seconds, a new world professional record run on a specially stringed course. Clyde’s sports had an international dimension with Australians, Finns and even Englishmen competing. The three main contenders in this last (the three miles) were Kohlemainen, Hans Holmer (USA) and George McCrae of Scotland. McCrae held a good second until the run for home when he dropped back. All three had competed elsewhere earlier in the day and Kohlemainen won on both occasions. At Shawfield was close up with Holmer well back. In July 1915 the papers of all descriptions carried page after page of soldiers killed in action. There were many photographs with simply the man’s name rank and regiment with the single word ‘killed’. There were probably no sports in 1915. The ‘Sunday Post’ on 30th July 1916 reported on the Clyde FC Sports. 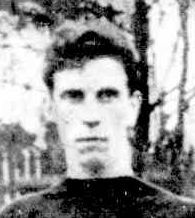 Boxing was again on the bill of fare (Mick McAdam of Airdrie v Tancy Lee of Edinburgh), and WR Applegarth ran in the 100 yards. 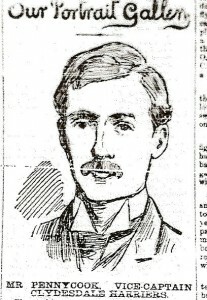 ‘Scotsman’ of 31st July: “Although the weather was somewhat depressing, there was an attendance of 15,000. Football was the chief attraction, although in the flat handicaps the presence of Applegarth, of London, probably attracted many to Shawfield. He was beaten in his heat of the 120 yards by W Irons, Leith, 15 yards, and his attempt at record in the 220 yards was a failure.” Events that year were 120 yards, 200 yards, half mile, Two Miles flat race open handicap. The boxing seemed to be a novelty and would be repeated the following year. An attendance of 15000 was big, even for the days when Rangers and Celtic were pulling them in in even bigger numbers for their sports in August. Football was always on the agenda and boxing had proved to be a good draw down through the years. However the time used for the football tournament and for the boxing tournaments meant that there was less time for the athletics. 1917 was a very interesting year for those following athletics at Shawfield. First of all there was an Amateur Sports under SAAA laws on Tuesday 24th July which included sprinting, distance running, junior 5-a-side, boxing (McGurk v Beattie, Cameron v Lindsay over 6 x 2 minute rounds, and then on 28th July there was a professional sports with races over 120y, 200y, 880y, One Mile and Two miles with prizes of 60/-, 20/- and 10/-, the exception being the 120y where the winner received 100/-. The former was reported in the ‘Daily Record’ which said that the SAAA meeting was a warm up for the Pro meeting at the weekend. Read it for yourself: As a preliminary to their annual sports meeting on Saturday first, Clyde FC sponsored a meeting under SAAA rules at Shawfield Park last night. Entries for the handicaps had filled out in satisfactory style, and the pick of the Glasgow Junior League clubs took part in the five-a-side football. A couple of boxing bouts completed an interesting programme. Fully 2000 spectators attended but unfortunately heavy showers prevented the intending late-comers from completing their journey.” Nevertheless, 2000 on a Tuesday night could not have been a bad evening for the club. The events held were 100 yards (5 Heats and a Final), 220 yards (6 Heats and a Final), half-mile and one mile. 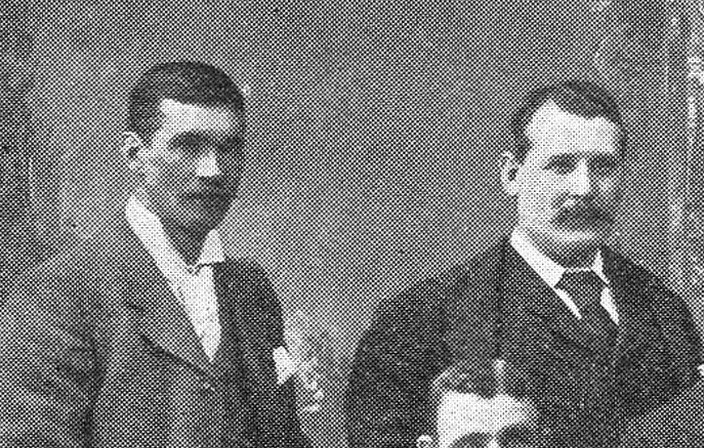 There were two 6 round boxing matches between McGurk and Beattie, and Cameron and Buchanan as well as the football. Then it was on to the Professionals at the weekend. ‘The Daily Record’ had magnificent coverage of the second meeting under the headline ‘Double at Clyde’s Pro Gala: Ayrshire runner wins distance events”. 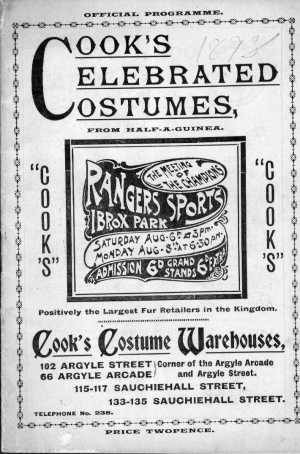 The report’s opening sentences (written by Cessnock) read: “Clyde’s professional sports gala will not be long ere it is regarded as a summer institution, if it has not already attained that dignified position. That the meeting is popular we had further evidence on Saturday for there was a crowd of 17,000 at the Ru’glen Bridge enclosure, and their interest was sustained to the finish. … The feature of the meeting was the double victory in the distance races of J Lindsay, a Dreghorn runner who used to be associated with Bellahouston Harriers as an amateur. Lindsay was not “expected” in either event, for Donaldson of Bathgate was “barred” in the Mile, and Glen of Edinburgh was made favourite for the longer race. … Jack Donaldson and Cyril Mears, both Australians, competed in the two short distance events. Both were given too much to do in their present condition.” There was a half mile race won by the Hearts assistant trainer, Tommy Barclay. Other events were a 120 yards, a 220 yards, a One Mile and a Two Miles. The obligatory 5-a-side was won by Clyde who beat Rangers 2 – 1. Resources were scarce in 1918, the year the War ended, but on Saturday 27th there were several sports meetings held, albeit on a smaller scale than heretofore. The ‘Daily Record’ gave over its back page to photographs, one of which was the finish of the Ladies’ Race at Ibrox in the National Union of Railwaymen’s sports. The event was covered by the ‘Sunday Post’ however: most of the amateur clubs were represented (Bellahouston Harriers defeated Eglinton Harriers in the relay, and both clubs were well represented on the prize list) many of the prize winners were military men, there was a five a side tournament and an open tug of war. The ‘Post’ also covered the professional sports at Shawfield. Results only, probably because of the shortage of newsprint. 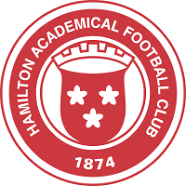 Events included 100 yards, 220 yards, half-mile and one mile, all open handicap races, and a five a side with Clyde, Clydebank, Rangers, Partick Thistle, Celtic, Third Lanark, Queen’s Park and Hamilton Accies. Rangers beat Clydebank 2 – 0 in the Final. Out of the city, Greenock Glenpark Harriers had their annual sports meeting at Cappielow Park. The ‘Scotsman; on 28th July, 1919, reported on that year’s Clyde FC Sports like this: “The seventh annual professional sports meeting was held at Celtic Park (granted by Celtic FC), Glasgow, on Saturday in brilliant weather and in presence of 15000 spectators. 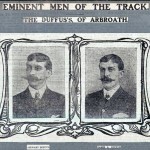 J Donaldson (Australia), J Mears (Australia), and G McCrae (Edinburgh) competed. A feature of the afternoon was an attempt by G McCrae to set up new figures for the Three Miles. He failed, however, to reproduce his real form and finished fourth in only moderate time. “There followed a list of what they called ‘principal results’. There were 100 yards (won in 9.8 off 10 1/2 yards), 220 yards won in 22 seconds (off 22 yards), half mile (won in 1:57.2 off 60 yards), mile won in 4:22.4 off 100 yards and a three miles won in 14:45.4 off 100 yards. Rangers beat Clyde in the 5-a-side by 3 – 1. The ‘Sunday Post’ gave it a much bigger spread but agreed with the ‘Scotsman’ that McCrae was the headline story. 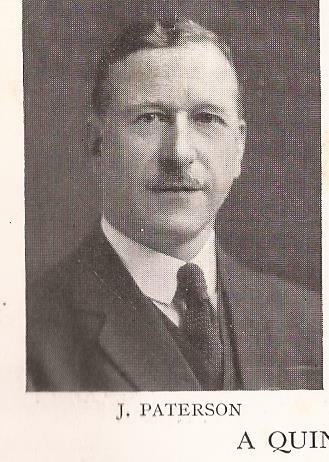 It also pointed out that Mr William Struth was the handicapper. 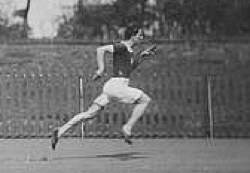 He had been a professional sprinter himself in his heyday and was in 1919 employed by Clyde FC who were clearly maximising use of his talents. The report then went on to cover the individual events in some detail – an account of each heat plus a detailed description of the Final. Track events were 120 yards, 220 yards, half-mile, a One Mile event (in which McCrae did not start, reserving his powers for the bigger race to come), and the Three Miles. The task set McCrae was beyond him with the winner, off 190 yards (ie nearly at the end of the back straight to McCrae on scratch), the second placed runner had a start on McCrae of 550 yards (ie one and a quarter laps) and third off 250 yards. McCrae finished but was almost 200 yards behind the winner. 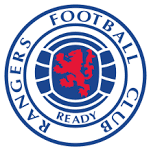 Rangers beat Clyde 4 – 0 in the football competition. In terms of popularity and drawing in the crowds, the Clyde had seemed to get it right. Minimal athletics involvement, boxing tournaments, 5-a-side football, motor scooter racing. penalty kick competitions – all the fun of the fair in fact. The growth in crowd size when they decided to abandon amateur athletics and go for entertainment seemed to prove that – from a couple of thousand, to 10,000, to 15,000, to 17,000 to 40,000. And that growth was secured while the awful carnage of the first world war was continuing on the continent, when papers were listing the dead at least once a week by the end of the war, almost daily at the start. 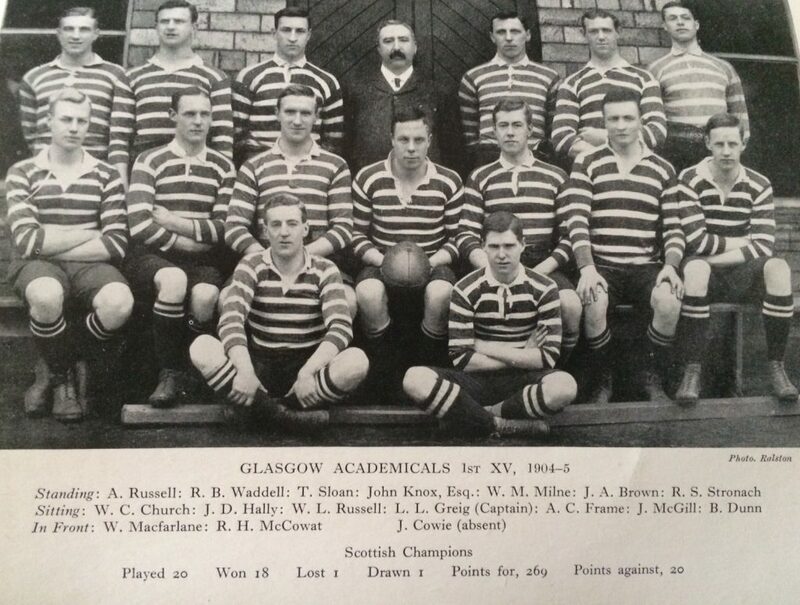 But if the formula was working so well, why did the club return to the amateur fold in the mid 20th century?